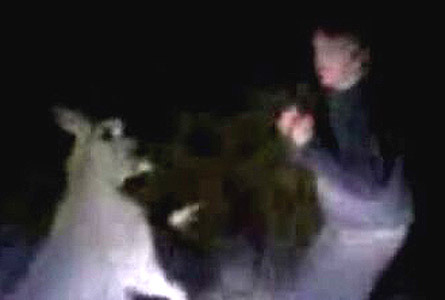 That two socially immature males would cruelly bash and kick unconscious a kangaroo whilst capturing the sickening spectacle on video in an apparent attempt to impress their social peers should hardly come as a surprise in a country which, unlike South Africa which nurtures and celebrates its herds of wildebeests, stigmatises the magnificent kangaroo as a pest like a blowfly. Kangaroos are so little understood in their own country, and their negative profile has minimised them as little more than "wood chips" for meat and skin exports. Public hatred of kangaroos is totally incomprehensible! How could kangaroos be more in abundance now than when Captain Cook sailed up the coast? There is less water in our rivers, less wetlands, less vegetation and more feral species, thanks to human mismanagement! Our biodiversity losses are of a world class standard. Kangaroos are scapegoats for livestock and human damage. The bashings, torture and killings of native animals, especially kangaroos, is surely a reflection on their status. We have officially-endorsed "culls" (read "massacres") such as at Canberra earlier this year, and another at Maria Island, Tasmania. Despite their falling numbers, their "harvest" quota is still set at 3.5 million! In Victoria, the DSE regularly give permits for killings when landowners are inconvenienced. Is it not surprising that there are low-lives that think that killings for entertainment are "fair go". Our wildlife needs to be protected as our national symbols, and any attacks or killings needs to attract heavy goal sentences and fines. We are famous for decimating our wildlife, and these sadistic attacks on kangaroos are a reflection of community attitudes that urgently need to change. 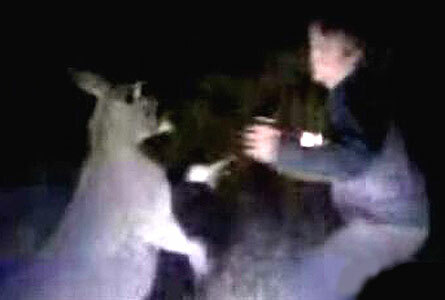 See also: Nationwide hunt for kangaroo basher (Western Australia Today) of 11 Sept 08, RSPCA launches nationwide hunt for kangaroo basher (ABC) of 11 Sept 08, RSPCA, police hunt for roo thug. I know that the mainstream press is running with this, but it seems to me that little good will come out of it. The public is presented with the notion that the RSPCA will deal with this 'aberration'. 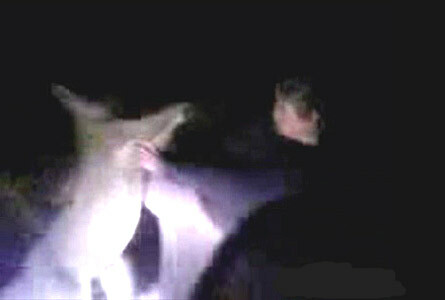 Only recently, also, in WA, a ranger, who had filmed a kangaroo dragged behind his car, was not prosecuted. This kind of behaviour is not surprising given the cavalier attitude of state governments practically everywhere towards kangaroos' welfare. Vivienne is right to ask if the kangaroo is stigmatised as a pest and a nuisance like the blowfly, why would not socially immature men hoping to impress their peers take it upon themselves to do a mortein job on a kangaroo? How can we expect fringe dwelling youth to love and respect their natural surroundings when the media daily lionises a race of highly destructive developers who, together with the corrupt politicians who serve them, trash everything nurturing around us?